The next time you go out to dinner, look around. Depending on the restaurant, there will be anywhere from a few people with their heads buried in their phones, to a ton of people in that position. If you don’t see any, keep watching, you will. This topic of discussion came up this past weekend when I took a trip outside of the Bay Area bubble to go visit my parents. My mother has the stance that I can only assume most mothers do: you shouldn’t check your phone at the dinner table. So naturally, to comply with her request, every few minutes I would check my phone under the table. I’d pretend to read the menu or fix my napkin to just be slyly looking straight down at my device beneath her line of sight — you know the drill. And while I was doing that, I would look around. Sure enough, there were a half dozen other people at the tables around me doing the same thing. Love it or hate it, this is becoming the norm. And when it fully becomes the norm, there will no longer be the same stigma attached to checking your phone at a restaurant. Naturally, my mother refuses to believe this will happen, but it’s happening already. Go out to dinner with people in their 20s or 30s. Or worse, go out to dinner with teenagers. When I go out to dinner with my peers these days, it’s not considered weird at all to pull out your phone. In fact, the situation has sort of reversed itself: you feel awkward if everyone else is using their phones and you’re not. It happens. A lot. Obviously, at a fancy restaurant this behavior is less prevalent than at a bar. But it’s still increasingly happening all around you. And it has made going to dinner so much better. I shouldn’t have to state the obvious, but I will: using your phone in this context does not mean talking on the phone. That is still very frowned upon in restaurants for a very good reason: it’s annoying. A person talking on their phone is making noise, a person using their phone (as in surfing the web, sending texts, using apps, etc) is often doing the exact opposite. Of course, the stigma around using the phone at the table stems from the same idea: it’s considered rude. But again, it’s not rude as in annoying, it’s rude as in you’re ignoring those around you. It challenges the social norm that when you go out to dinner with people, you’re supposed to have conversations with them. Here’s the thing: the common misconception that my parents and others have about using the phone during dinner is that it’s antisocial. But increasingly, it makes dinner even more social. 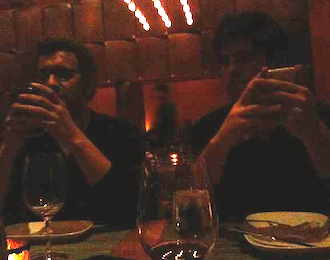 In the situations where I go out to dinner with my peers, use of the phone often augments the conversations being had. Don’t know who won game 3 of the 1995 World Series? Don’t know who directed that movie you all saw? It’s all right there in your pocket. But even more fascinating is when the topic of conversation now often revolves around the phones themselves — or more specifically, what is on them. Tweets, Instagrams, Belugas, etc. These all now spark new conversations or tidbits of personal connection. And then there are the shared experiences of doing things like checking-in or Foodspotting. One person at a table doing it often trigger everyone else to as well. Forgive me, but it’s Dinner 2.0. And again, I’m having more fun at these dinners than I ever have. Is part of it antisocial? Sure. Can it lead to distractions if you read a work-related email that you need to respond to? Of course. But this is the way the world works now. We’re always connected and always on call. And some of us prefer it that way. What’s annoying to me isn’t someone using their phone at the table, it’s the people who really believe I shouldn’t be allowed to use my phone. Why? So I can repress the desire I have to check the phone while failing to engage in a conversation so I can be able to quickly excuse myself to go to the bathroom to check the phone? Makes sense. It’s exactly why things are changing. Get with the program, or get out of the way. What’s more likely? In ten years, everyone goes to a restaurant and talks to one another without pulling out their phones at the table — or in ten years, the table is designed in a way to enable you to more easily use your phones? That’s an easy one.